HISTORIA DEL FÚTBOL ESPAÑOL, SELECCIONES ESPAÑOLAS. ISBN 978-84-8229-123-9 （西班牙语）. ^ FIFA World Cup South Africa 2010: List of Players (PDF). FIFA. 2010-06-04: 29 [2014-04-20]. ^ Fernando Torres. 切爾西足球會. [2014-08-05]. （原始内容存档于2014-08-22）. ^ Fernando Torres condecorado con la Medalla 'Ciudad de Fuenlabrada'. SER Madrid Sur. 2009-02-06 [2010-03-13] （西班牙语）. ^ 4.0 4.1 4.2 Infancia. Fernando Torres. [2010-06-20] （西班牙语）. ^ Samuel, Martin. Fernando Torres talks to Martin Samuel: Liverpool's Spain superstar on Kaka, feeling at home and the battle to stop Manchester United's title chase. Daily Mail (London). 2009-01-19 [2009-02-08]. ^ Torres asegura que habría sido "un gran portero". Marca (Madrid). 2008-04-17 [2011-05-18] （西班牙语）. ^ Japanese comic superhero drawn to Tokyo Olympic bid. The Free Library (taken from Agence France-Presse). 2009-08-11 [2010-06-20]. ^ 8.0 8.1 8.2 8.3 8.4 8.5 Atlético de Madrid. Fernando Torres. [2008-11-17] （西班牙语）. ^ 9.0 9.1 9.2 Lowe, Sid. Will Torres be Kop's new God or just another Fernando?. 衛報 (London). 2007-07-04 [2014-08-05]. ^ 10.0 10.1 10.2 10.3 10.4 Primer equipo. Fernando Torres. [2008-11-17] （西班牙语）. ^ 11.0 11.1 11.2 11.3 Torres. FootballDatabase. [2008-06-08]. （原始内容存档于2009-02-15）. ^ Chelsea sign Bridge. The Daily Telegraph (倫敦). 2003-07-21 [2013-01-30]. ^ Statistics: top scorers: 2003/2004. ESPN FC. [2014-08-05]. ^ 14.0 14.1 14.2 UEFA Intertoto Cup 2004. Rec.Sport.Soccer Statistics Foundation. [2008-06-09]. ^ Atletico warn Chelsea off Torres. BBC Sport. 2005-06-28 [2011-05-18]. ^ Atletico prepared to sell Torres. BBC Sport. 2006-01-24 [2011-05-18]. ^ Newcastle want me, claims Torres. BBC Sport. 2006-03-16 [2011-07-27]. ^ Adams, Tom. 'Flattered' Villa to stay with Che. 天空體育. 2007-02-06 [2014-08-05]. ^ Prentice, David. Torres is Reds' number one target. Liverpool Echo. 2007-06-20 [2007-06-30]. （原始内容存档于2013-06-03）. ^ No Reds offer for Torres. The Daily Star (Dhaka). 2007-06-27 [2010-06-20]. （原始内容存档于2012-10-24）. ^ Kay, Oliver. Garcia the key as Liverpool step up pursuit of Torres. The Times (London). 2007-06-28 [2010-06-20]. ^ 22.0 22.1 Liverpool complete Torres signing. BBC體育. 2007-07-04 [2011-05-18]. ^ Carrick, Charles. Torres' £27m Liverpool deal. The Daily Telegraph (London). 2007-06-30 [2011-05-18]. ^ 24.0 24.1 Liverpool wrap up record Torres transfer. The Guardian (London). 2007-07-04 [2014-08-05]. ^ Balague, Guillem. Rafael Benitez opens up on transfers, treachery, Torres, titles – and, of course, tinkering. 倫敦: 维基文库. 2008-03-31. ^ Sinnott, John. Aston Villa 1–2 Liverpool. BBC體育. 2007-08-11 [2011-05-18]. ^ Sanghera, Mandeep. Toulouse 0–1 Liverpool. BBC Sport. 2007-08-15 [2011-05-18]. ^ Chowdhury, Saj. Liverpool 1–1 Chelsea. BBC Sport. 2007-08-19 [2011-05-18]. ^ McKenzie, Andrew. Reading 2–4 Liverpool. BBC Sport. 2007-09-25 [2011-05-18]. ^ Sinnott, John. Liverpool 4–1 FC Porto. BBC體育. 2011-11-28 [2011-05-18]. ^ Moyes & Torres win monthly awards. BBC體育. 2008-03-07 [2011-05-18]. ^ Barrett, Tony. Fernando Torres: My pride at Anfield hat-trick record. Liverpool Echo. 2008-03-06 [2014-08-05]. ^ May, John. Liverpool 2–1 Reading. BBC體育. 2008-03-15 [2011-05-18]. ^ McKenzie, Andrew. Liverpool 4–2 Arsenal (agg 5–3). BBC Sport. 2008-04-08 [2011-05-18]. ^ Goalscorers for the 2001–2002 season. LFChistory.net. [2011-05-18]. ^ Ronaldo tops PFA nominations list. BBC Sport. 2008-04-11 [2011-05-18]. ^ 38.0 38.1 Ronaldo named player of the year. BBC Sport. 2008-04-27 [2011-05-18]. ^ Ronaldo wins writers' award again. BBC體育. 2008-05-02 [2011-05-18]. ^ Torres equals Hunt record. Football.co.uk. 2008-05-05 [2014-08-05]. （原始内容存档于2014-08-10）. ^ Caroe, Charlie. Jose Reina: Fernando Torres will improve. The Daily Telegraph (倫敦). 2008-05-06 [2011-05-18]. ^ Statistics: top scorers: 2007/2008. ESPN FC. [2014-08-05]. ^ Caroe, Charlie. Chelsea target Liverpool's Spanish striker Fernando Torres with £50 million bid. 每日電訊報 (倫敦). 2008-05-26 [2011-05-18]. ^ Torres pledges long-term future to Reds. ESPN FC. 2008-05-31 [2014-08-05]. ^ Hicks laughs off Torres sale talk. BBC體育. 2008-06-17 [2011-05-27]. ^ Stevenson, Jonathan. Sunderland 0–1 Liverpool. BBC體育. 2008-08-16 [2011-05-18]. ^ Eaton, Paul. Reds confirm Torres injury. 利物浦足球會. 2008-09-01 [2012-06-18]. ^ Sanghera, Mandeep. Marseille 1–2 Liverpool. BBC體育. 2008-09-16 [2011-05-18]. ^ McNulty, Phil. Everton 0–2 Liverpool. BBC體育. 2008-09-27 [2011-05-18]. ^ Sanghera, Mandeep. Man City 2–3 Liverpool. BBC體育. 2008-10-05 [2011-05-18]. ^ Custis, Neil. Man City 2 Liverpool 3. 太陽報 (倫敦). 2008-10-05 [2012-06-20]. ^ Torres ruled out for '10–15 days'. BBC體育. 2008-10-16 [2011-07-27]. ^ McNulty, Phil. Atletico Madrid 1–1 Liverpool. BBC體育. 2008-10-22 [2011-05-18]. ^ Ogden, Mark. Fernando Torres puts Chelsea-Liverpool clash ahead of Atletico Madrid return. The Daily Telegraph (倫敦). 2008-10-21 [2011-01-21]. ^ Ronaldo voted FIFPro World Player of the Year. UEFA. 2008-10-27 [2011-05-18]. ^ Hughes, Ian. Liverpool 3–0 West Brom. BBC體育. 2008-11-08 [2011-05-18]. ^ Torres open to Atletico return. 天空體育. 2008-11-09 [2014-08-05]. 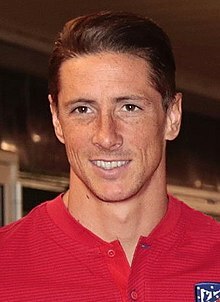 ^ Striker Torres faces new lay-off. BBC體育. 2008-11-27 [2011-07-27]. ^ Liverpool hit by Torres setback. BBC體育. 2008-12-04 [2011-07-27]. ^ Ronaldo, Torres up for Fifa award. BBC體育. 2008-12-12 [2011-05-18]. ^ Ronaldo collects Fifa world title. BBC體育. 2009-01-12 [2009-01-12]. ^ Ashenden, Mark. Preston 0–2 Liverpool. BBC體育. 2009-01-03 [2011-05-18]. ^ McNulty, Phil. Liverpool 2–0 Chelsea. BBC體育. 2009-02-01 [2009-02-01]. ^ Evans, Tony. The 50 greatest Liverpool players. 泰晤士報 (倫敦). 2009-02-13 [2009-02-22]. ^ Brown, David. Fernando Torres used powers of persuasion to play against Real Madrid. 泰晤士報 (倫敦). 2009-03-11 [2009-04-13]. ^ McNulty, Phil. Liverpool 4–0 Real Madrid (agg 5–0). BBC體育. 2009-03-10 [2011-05-18]. ^ McNulty, Phil. Man Utd 1–4 Liverpool. BBC體育. 2009-03-14 [2011-05-18]. ^ Giggs earns prestigious PFA award. BBC體育. 2009-04-26 [2011-05-18]. ^ Brett, Oliver. Liverpool 3–1 Tottenham. BBC體育. 2009-05-24 [2009-05-25]. ^ Torres agrees new Liverpool deal. BBC體育. 2009-05-28 [2011-07-27]. ^ Torres signs new Liverpool deal. BBC體育. 2009-08-14 [2011-07-27]. ^ Torres signs contract extension with Liverpool. ESPN FC. 2009-08-14 [2014-08-05]. ^ Ashenden, Mark. West Ham 2–3 Liverpool. BBC體育. 2009-09-19 [2011-05-18]. ^ Hunter, Andy. Priceless Fernando Torres slays Hull with a hat-trick show fit for a prince. 衛報 (倫敦). 2009-09-28 [2014-08-05]. ^ Torres and Ferguson scoop awards. BBC體育. 2009-10-02 [2011-05-18]. ^ McNulty, Phil. Liverpool 2–0 Man Utd. BBC Sport體育. 2009-10-25 [2011-05-18]. ^ Benitez hails quality of Torres. BBC體育. 2009-10-26 [2011-07-27]. ^ Leach, Jimmy. FIFA/FIFPRO World XI announced. 獨立報 (倫敦). 2009-12-22 [2014-08-31]. ^ Ornstein, David. Aston Villa 0–1 Liverpool. BBC體育. 2009-12-29 [2011-05-18]. ^ Rafa Benitez defends his decision to take off Torres. BBC體育. 2010-04-04 [2011-07-27]. ^ Liverpool's Fernando Torres out for rest of season. BBC體育. 2010-04-18 [2011-07-27]. ^ Gerrard and Torres staying at Liverpool – Hodgson. BBC體育. 2010-07-16 [2011-07-27]. ^ Hodgson expects Fernando Torres to stay at Liverpool. BBC Sport. 2010-07-27 [2011-07-27]. ^ Striker Fernando Torres committed to Liverpool. BBC體育. 2010-08-03 [2011-07-27]. ^ Sanghera, Mandeep. Liverpool 1–1 Arsenal. BBC體育. 2010-08-15 [2011-05-18]. ^ Sanghera, Mandeep. Liverpool 1–0 West Brom. BBC體育. 2010-08-29 [2011-05-18]. ^ Torres landmark nets WBA win. Liverpool F.C. 2010-08-29 [2012-06-18]. ^ Magowan, Alistair. Liverpool 2–1 Blackburn. BBC體育. 2010-10-24 [2011-05-18]. ^ Smith, Rory. Chelsea's £40 million bid for Liverpool striker Fernando Torres is an act of desperation. The Daily Telegraph (倫敦). 2011-01-27 [2011-02-06]. ^ Mondal, Subhankar. Quotes of the Week: 'Fernando Torres Tonight Submitted A Transfer Request', Wolfsburg Offer Volkswagens For Schulz And Adriano Galliani Is The New Moggi & More. Goal.com. 2011-01-29 [2011-02-06]. ^ Torres makes record move from Liverpool to Chelsea. BBC體育. 2011-01-31 [2011-07-27]. ^ McNulty, Phil. Chelsea 0–1 Liverpool. BBC體育. 2011-02-06 [2011-05-18]. ^ McNulty, Phil. Chelsea 3–0 West Ham. BBC體育. 2011-04-23 [2011-04-24]. ^ Magowan, Alistair. Stoke 0–0 Chelsea. BBC體育. 2011-08-14 [2012-03-19]. ^ McNulty, Phil. Man Utd 3–1 Chelsea. BBC體育. 2011-09-18 [2012-03-19]. ^ Williams, Aled. Chelsea 4–1 Swansea. BBC體育. 2011-09-24 [2011-09-25]. ^ Lemesre, Pascal. Fernando Torres handed red card after scoring. Sportsmole. 2011-09-24 [2011-09-24]. ^ Fernando Torres: Chelsea start has been 'very, very difficult'. 衛報 (倫敦). 2011-09-26 [2013-04-12]. （原始内容存档于2011-12-06）. ^ Shemilt, Stephan. Chelsea 5–0 Genk. BBC體育. 2011-10-19 [2012-03-19]. ^ Chelsea 2–0 Hull City. The Guardian (London). 2013-08-18 [2013-10-24]. ^ Chelsea and John Terry draw at Tottenham Hotspur but Torres sees red. The Guardian (London). 2013-09-29 [2013-10-24]. ^ Schalke fall to clinical Chelsea. UEFA. 2013-10-22 [2013-10-22]. ^ Champions League 2013/14: Fernando Torres hits brace in Chelsea victory over Schalke. The Sydney Morning Herald. 2013-10-22 [2013-10-22]. ^ Winter, Henry. Chelsea 2 Manchester City 1: match report. The Daily Telegraph (London). 2013-10-27 [2013-10-27]. ^ Fernando Torres: AC Milan seal loan deal for Chelsea striker. BBC體育. 2014-08-31 [2014-08-31]. ^ Fernando Torres: AC Milan seal loan deal for Chelsea striker. BBC體育. 2014-08-31 [2014-12-28] （英语）. ^ Milan 0-1 Juventus. BBC體育. 2014-09-20 [2014-09-21]. ^ Empoli 2-2 Milan. BBC體育. 2014-09-23 [2015-01-04]. ^ AC Milan sign Chelsea's Fernando Torres on permanent deal. BBC體育. 2014-12-27. （原始内容存档于2014-12-28）. ^ Fernando Torres: Atletico Madrid loan deal for AC Milan striker. BBC Sport. 2014-12-29 [2014-12-29]. ^ Official: Cerci joins AC Milan on loan. A.C. Milan. 2015-01-05 [2015-01-05]. ^ Fernando Torres: Atletico Madrid fans welcome striker on return. BBC體育. 2015-01-04 [2015-01-04]. ^ Atl Madrid 2-0 Real Madrid. BBC Sport. 2015-01-07 [2015-01-07]. ^ Real Madrid 2-2 Atl Madrid. BBC體育. 2015-01-15 [2015-01-15]. ^ Reddy, Luke. Atl Madrid 2-3 Barcelona. BBC體育. 2015-01-28 [2015-01-28]. ^ Atlético Madrid through after penalty pressure sinks Bayer Leverkusen. 衛報. 2015-03-18. ^ Atl Madrid 2-0 Getafe. BBC. 2015-03-21. ^ Sherlock, Harry. Fernando Torres to join Sagan Tosu in Japan. Goal. 2018-07-10 [2019-04-05]. ^ 9. Fernando Torres. Liverpool Echo. [2008-06-08]. （原始内容存档于2012-10-13）. ^ Fernando Torres Sanz. NNDB. [2010-07-11]. ^ Football is a funny ol game. 太陽報 (倫敦). 2008-04-15 [2009-01-13]. ^ Galaz, Mábel. Se casa Fernando Torres. El País (Madrid). 2009-05-28 [2012-03-19] （西班牙语）. ^ Fernando Torres welcomes baby 'Leo' after dodging Liverpool match at wife Olalla's bedside. 每日郵報 (倫敦). 2010-12-07 [2010-12-19]. ^ Liverpool star Fernando Torres becomes a dad. Daily Mirror (London). 2009-07-10 [2011-05-18]. （原始内容存档于2013-05-13）. ^ Liverpool 3–0 Aston Villa. Liverpool F.C. 2010-12-06 [2012-06-18]. ^ Balls to the Crunch. FourFourTwo. February 2009: 50. ^ Fernando Torres (V). Internet Movie Database. [2010-06-20]. ^ Dani Martín. Fernando Torres. 2005-09-30 [2010-06-20] （西班牙语）. ^ Full cast and crew for Torrente 3: El protector. Internet Movie Database. [2010-06-20]. ^ Wilson, Simon. El Nino: My Story. ESPN FC. 2009-10-02 [2013-04-11]. ^ Famous Tolkien and Lord of the Ring fans. Tolkien Library. [2013-07-04]. ^ 138.0 138.1 138.2 138.3 138.4 138.5 138.6 138.7 138.8 138.9 Palmarés. Fernando Torres. [2008-11-17] （西班牙语）.